If you’re looking for electrotherapy units, our selection covers a wide range of applications. Rich-Mar EVO CM2 and CM4 units can provide concurrent treatments of electrotherapy, traditional ultrasound, Autosound hands-free ultrasound, therapeutic laser and SLD light therapy. 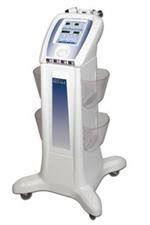 We also carry dedicated ultrasound units and laser phototherapy systems. Our economy and premium tens units assist in helping patients manage pain in a cost effective manner. Chattanooga and Rich-Mar iontophoresis units from e-current.com are simple solutions for your clinical drug delivery needs. If your patient population includes difficult to treat cases with denervated tissue, try our EMSII DC point stimulator. Need modality carts or replacement leadwires for your electrotherapy units? We have those and other electrotherapy accessories for your practice, including high quality, low cost electrodes, conductive electrode spray, ultrasound gel, Nylatex electrode wraps, and replacement hospital grade power cords. Whatever your electrotherapy products needs, e-current.com can supply your clinic with cutting-edge technology and industry-leading tools.